Following successful completion of the 200km fundraising challenge by the South African Legion, two worthy causes benefited from this endeavour. The challenge is the largest multi-day marching event in the world. 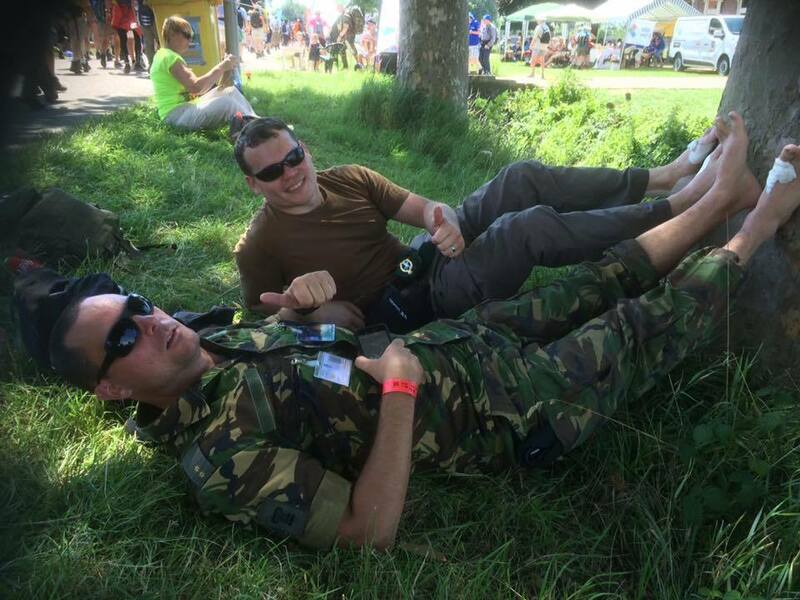 Held annually in the Netherlands, it is renowned for forcing individuals to pit willpower and commitment against heat, pain, and exhaustion. Two charitable causes benefited from this fundraiser, with £1,917 to be split between the South African Legion and the recent Knysna fire relief effort.England Chairman Lgr Claudio Chistè marched ±11.5 hours a day over four days (July 18-21), over various routes surrounding the city of Nijmegen near the German border, starting at 04:00 each morning. To further challenge endurance, this was conducted in marines-style military marching kit with appropriate weight throughout the event. A short ceremony was held was held on August 28 to entrust the Mayor of Knysna, Eleanore Bouws-Spies, with £963.50 for the relief effort following the devastating fires by England President of the SA Legion, Lgr Peter Dickens – who was also officiating on behalf of the SA Legion in South Africa (the local branch is in George). The Mayor expressed deep gratitude, commending the SA Legion and felt that this was a stand-out in terms of an individual contribution, conveying a sense of awe of the physical and endurance limits set for the ‘Marching for Others’ challenge which was undertaken. The SA Legion was commended on the effective media and marketing efforts used to extend contributions to the victim’s fund and grateful for the awareness of the Knysna fires, which had been used on international media and marketing forums. This resulted in international contributions finding their way to Knysna using crowdfunding. It was felt appropriate that the Mayor’s office would look at the list of fire victims and evaluate whether any were military veterans, earmarking these funds accordingly. 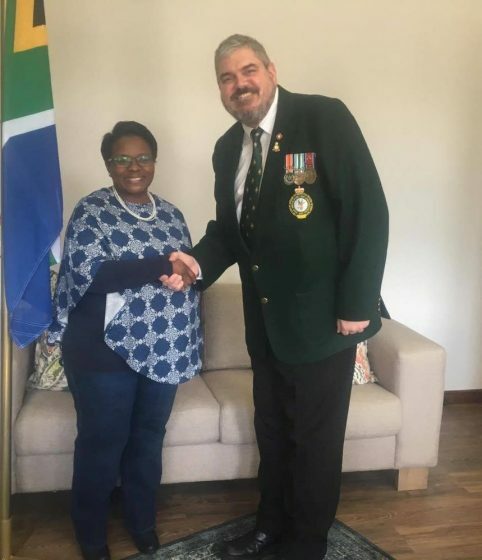 The Mayor and her team were interested to hear of the history of SA Legion, and were especially interested in activities being undertaken, ranging from parades to selfless activities such as these. 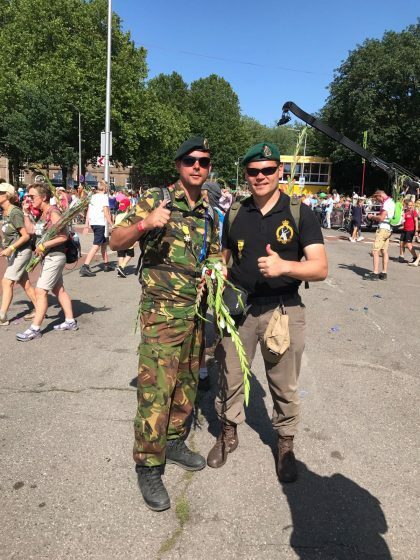 The South African Legion conquered the 101st Four Days March Njimegen, the Netherlands; the largest multiple day marching event in the world. 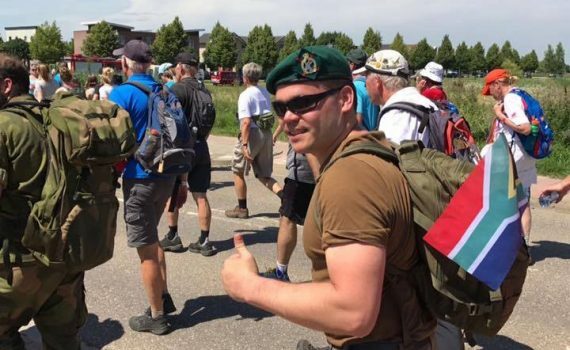 England Chairman Lgr Claudio Chiste` completed the 200km challenge over 4 days in military marching kit to raise funds for the South African Legion, with amazing support and encouragement from the South African Legion UK & Europe. The history of this march started in 1909 (being based in Nijmegen since 1916), in order to maintain the operational marching capability of the Dutch Army. Foreign groups were only being allowed to enroll later in 1928. To date, the event hosts delegations from more than 60 countries, both military and civilian, with this year seeing a total of 47,000 registrations (with 38,000 finishing). During the march there is a range of elements: humidity, temperature, rain, heat, cold, which after 11.5 hours of daily marching negatively affects the cleanliness of your socks and footwear. Blisters are a given as uphill, downhill or uneven paths; gravel, concrete, dirt or cobblestones can all contribute. 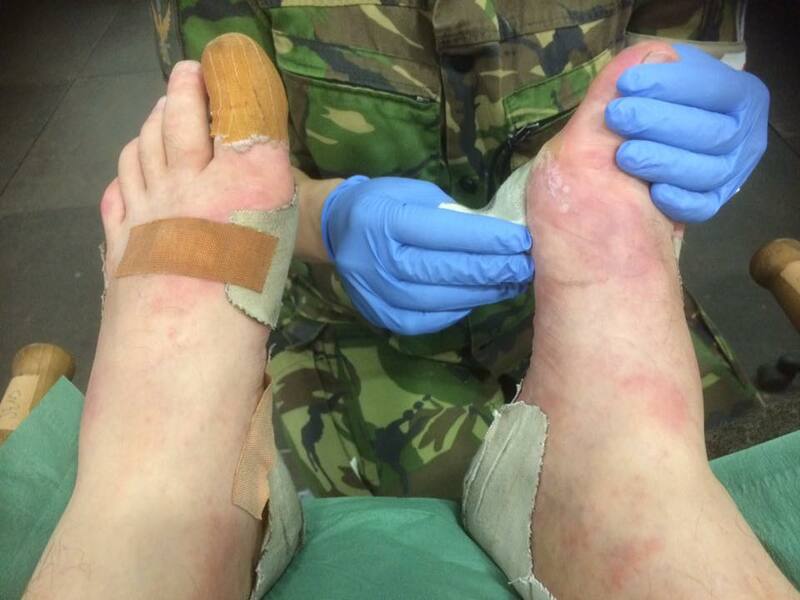 There are certain medical check points every 10km; however blisters could strike at any time, for which you should be educated in first aid blister draining and patching in order to make it through the day. Incorrect foot care could result in being sidelined with a foot infection. The worst thing you can do is ‘tough it out’ and soldier on… This might work on final stretch of the last day… however doing this on day 1-3 may create a sidelining injury, such as no skin left on your heel. Blisters will happen at some point during the training or event. Each 10km there was a 15min break to rest the legs (elevate to promote blood circulation) and hydrate. Lgr Claudio Chiste`, alongside his marching partner Bob, an officer in the Dutch Army.Each day typically ended at circa 23:30 (bed time), with a 02:00 wake-up in order to have breakfast at 02:20 and be ready to leave camp fully kitted for 03:30 to be in time for the 04:00 marching start time (max 3 hours sleep for the four nights of the march). The event was well organised; despite the days which were either extremely hot or rainy proving challenging for participants, the local population helped keep spirits lifted with offerings of refreshments and the blaring sound of Dutch folk music. The fundraising target of £2,000 was surpassed. 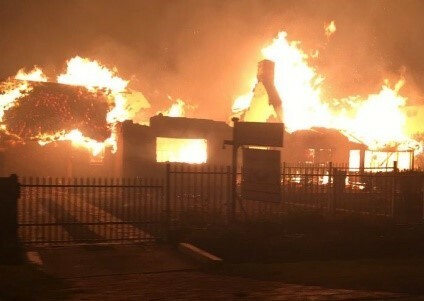 Approximately half of these funds will go to the SA Legion UK & Europe to contribute to the fund which will assist mostly UK-based vets in need, with the remaining funds to be directed to assist the victims of the recent Knysna fires. 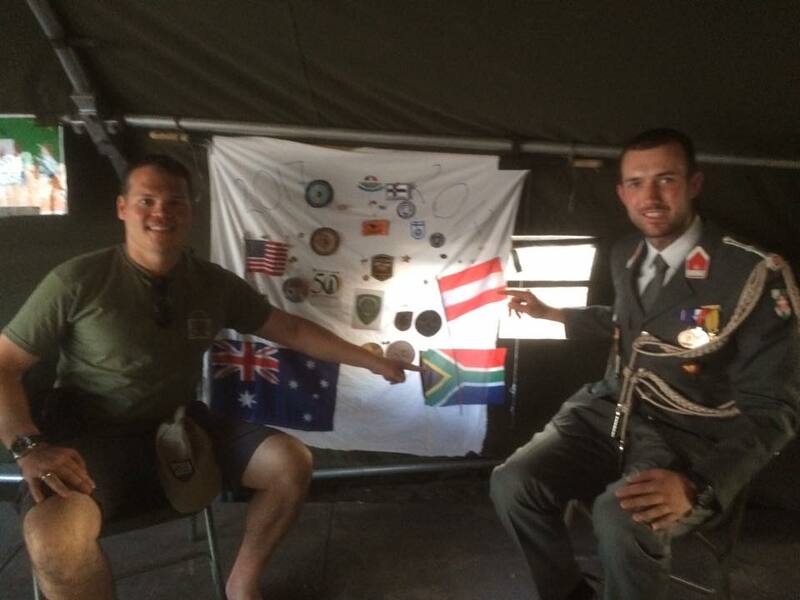 Legionnaires are encouraged to follow this example, taking on meaningful projects or challenges to raise funds.